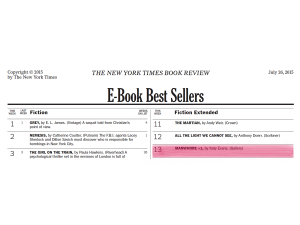 Katy Evans’ “Manwhore +1” Debuts on the New York Times E-Book Best Sellers List! Congratulations to Katy Evans on another bestseller with Manwhore +1 of the Manwhore series! New Image for Kyra Davis’ “Just One Lie” Available July 28th! Mercy is torn between the wild, unpredictable and reckless Ash versus the ambitious, dependable and strong Brad. 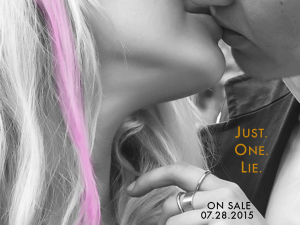 Find out who Mercy loves in Kyra Davis’ Just One Lie. 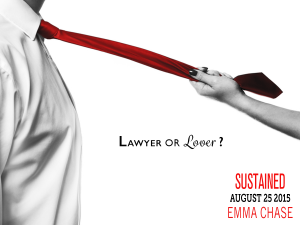 This summer, in and out of the courtroom, Jake Becker and Chelsea McQuaid have more than a few surprises up their sleeves in New York Times bestselling author Emma Chase’s new novel Sustained. Maya Banks’ “Safe at Last” Debuts on the New York Times E-Book Best Sellers List! Congratulations to Maya Banks on yet another big bestseller with her latest novel Safe at Last, the third installment of the Slow Burn series! Kim Karr’s “Toxic” Available Next Week! Will they or won’t they? Readers will finally know when Kim Karr’s new standalone novel Toxic is on sale next week. Sustained’s Jake Becker has never met his match in the courtroom, but this summer Chelsea McQuaid is serving a summons he won’t be able to resist. Emma Chase’s new standalone novel is available August 25th. Excitement is high for New York Times bestselling author Kyra Davis’ upcoming novel Just One Lie,the highly anticipated follow-up to New York Times bestseller Just One Night, available on July 28th. Check out a great interview with actress Sofia Vergara from this month’s Interactive Media Tour with Celebuzz! Anticipation is growing for Katy Evans’ Manwhore+1 with this new campaign image. Is Rachel a saint or sinner? Find out in New York Times bestselling author Katy Evans’ Manwhore+1 available July 7th.